Accomplished nutrition professionals possess special attributes and talents that enable them to not only succeed in the work they do each day but go above and beyond what’s expected to spread the word about nutrition, health, and wellness in creative ways within their communities and across the globe. In honor of National Nutrition Month and Registered Dietitian Day, we asked readers to nominate colleagues and mentors who exhibit these traits and do exceptional work that’s making a positive impact. Of the more than 100 nominations we received, we selected 10 deserving RDs to be recognized for their incredible accomplishments and dedication to the field. 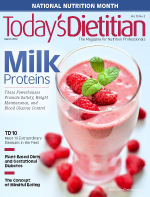 Some of the dietitians have published best-selling books, participate in international humanitarian efforts, have succeeded against difficult odds, founded specialty nutrition businesses, direct large healthcare organizations, or serve the underprivileged, and one dietitian in particular established her own food company and even created a granola bar. Please enjoy reading these profiles and congratulate yourselves for the wonderful work you do every day to help clients and patients live healthier lives. Kate Geagan is a well-known dietitian who has become an outspoken leader in helping people understand the connection between food and the Earth’s climate. She’s also a well-known name in the media as an expert for the Dr. Oz Show as well as the author of a best-selling diet book, Go Green, Get Lean: Trim Your Waistline With the Ultimate Low-Carbon Footprint Diet. With a long list of notable accomplishments, there’s no question her work in the field is impressive. But it’s also Geagan’s nondietetic leadership role that deserves recognition. After seeing a heart-wrenching story on the Lost Boys of Sudan on The Oprah Winfrey Show, Geagan was inspired to take action. With the help of her sister and a neighbor, The Chier Foundation was formed to provide money for college educations for the Lost Boys and Girls of Sudan who now call Utah their home. To date, the organization has raised more than $250,000 and sent more than 60 Lost Boys to college. Currently, more than 30 have graduated college, and one is attending medical school. Geagan says those who haven’t finished yet “cycle in and out” of school, as they’re working multiple jobs to send money back home to their families. In private practice for 24 years, H. Theresa Wright has built up a clientele base full of tough cases. Her clients are anorexics, bulimics, compulsive overeaters, food addicts, binge eaters, alcoholics, and even drug addicts. It always has been her gentle, patient, and compassionate nature as a nutrition therapist that has driven these clients to her and keeps them coming back. In fact, Wright’s clients aren’t only local but have come from 41 states and countries, including Hawaii, Canada, Switzerland, England, and Jordan. She does her long-distance work on the telephone and the Internet. Working full time in corporate public relations, Stacey Antine ran the global food practice of a major corporation. When she decided it would help to get her RD degree, never did she consider whether it would lead to a brand new career. But it was during her internship at Beth Israel Medical Center in New York City that Antine experienced a wake-up call when she realized how many kids were being treated for obesity. HealthBarn offers summer camps, classes, and more to teach children about food, how to make good food choices, and how to grow their own food. Celebrity chef Rachael Ray has called HealthBarn USA “a great idea,” and it’s been featured on networks such as CNN and PBS. Starting her career as a WIC dietitian in Shasta County, Marta McKenzie had a passion for her clients and for breast-feeding that dramatically increased the program and expanded services to some of the most rural areas. Her leadership skills have led to several promotions over the years, but the initial passion that drove her remains. McKenzie was instrumental in opening breast-feeding support centers available to the entire community, not just WIC families, which produced breast-feeding rates that were the top five in the state. For 10 years, she also served as deputy director and director of public health in Shasta County and became recognized as a leader in population-based nutrition and chronic disease prevention. As a result of her success, she was promoted to director of the Shasta County Health and Human Services Agency in 2006 when the public health, mental health, and social services departments were merged into one large health agency. Lora Williams is a testament that the path to success often is paved with failure. In her case, perhaps it has been more hardship than failure, but either way, she admits it hasn’t been an easy road. At the age of 30, Williams realized she was making the same amount of money that she did in high school and needed to go back to school. At that same time, she became pregnant, and her baby’s father left her. Even after Williams graduated, she says life wasn’t easy. It was 2008, and there were no jobs. As a big believer in family, she and her child moved from New York to Texas with her mother, and started offering nutrition services out of her living room. Slowly but surely, she got insurance, her own office, and even some volunteers, starting out in a small single-room office. Today, she has an 1,800-square-foot office of her own. Williams says she hasn’t “made it” yet, but she hopes to secure more funding and has bigger plans and feels things are falling into place. Penny M. Kris-Etherton became interested in lipids research early in her career. Studying the relationship between diet and cardiovascular disease, she became fascinated with how great of an impact dietitians can have in helping people decrease their disease risk. “I had such a passion seeing how nutrition can affect not only lipids but a lot of other proteins and risk factors, so I continued with my research and got involved with the National Lipid Association,” Kris-Etherton says. Serving as a past president of the organization, Kris-Etherton continues to be involved in the association. Along the way, she’s demonstrated how dietitians can collaborate within a multidisciplinary team. Over the years, Kris-Etherton has coauthored hundreds of articles on the role of nutrition in lipids management in national and international journals. She also has partnered with the American Heart Association to provide teaching tools for the public. One of the programs she collaborated on was the Heart-Check Mark, a symbol the public can look for on products for an easy heart-healthy reference. She also helped create a nutrition task force within the National Lipid Association. In 1997, Stacia Nordin and her husband, Kristof, headed to Malawi for two years to work with HIV patients. She was a dietitian in the field of HIV and nutrition, while her husband was working in community development promoting HIV awareness and prevention. Nordin says it didn’t take long for them to realize they needed to stay much longer than two years to make the impact they desired. The Nordins have lived in Malawi for 16 years, and their efforts, known as Never Ending Food, focus on permaculture (the development of agricultural ecosystems intended to be sustainable and self-sufficient) and nutrition. Permaculture’s purpose is to “create abundance” for people while also taking care of the earth, Nordin explains. Even the couple’s daughter helps with the effort. Nordin says she and her husband recognized that a connection between the problems and the solution kept coming back to the health of the environment. “When our environment is healthy and systems are well designed, the environment can provide us with an abundance of healthful food, water, air, medicines, building supplies, seeds, and natural fertility—on short, all that we need,” she says. Brenda Navin grew tired of seeing so many clients come through her door with needs too great for her to meet alone. In her nutrition therapy role at the Woodwinds Health Campus, part of the HealthEast Care System, she wanted to do more. But many clients needed more than nutrition support. So six years ago, she and a colleague formed Ways to Wellness, a program that’s part of the HealthEast System that provides nutrition, fitness, and health and wellness coaching. The effort has grown ever since. Though the undertaking began with the efforts of just two dietitians, Ways to Wellness has grown to a staff of nine that now includes personal trainers and certified health and wellness coaches. Today there’s even a cardiologist who works closely with the program. Working as a dietitian in the neonatal ICU (NICU) and the pediatric unit at Elliot Hospital for more than 20 years, Fran Van Geyte has a passion for getting her patients the best possible care from the start. When she first began her career, Van Geyte was the only NICU-based dietitian in the state of New Hampshire. Though she’s garnered numerous accomplishments in the neonatal field over the years, the list doesn’t stop with her professional career. One of Van Geyte’s personal passions is organic and local farming, which stemmed from seeing the connection between healthful eating and a baby’s growth. Initially, she helped other farmers distribute organic vegetables from her own backyard, but several years ago she and her husband founded New Hampshire Community Supported Agriculture, which has expanded to include leasing part of a 400-acre land trust for the purpose of organic farming. It’s not unusual for Diane Kress to receive letters—even gifts—from avid fans who have read her book The Metabolism Miracle and say it’s the only program that’s ever helped them lose weight and keep it off. Kress says she discovered the nontraditional approach when she was diagnosed with type 2 diabetes and high cholesterol despite eating a healthful diet. Kress began to do some research within her own patient base, taking a close look at who was succeeding and who wasn’t. What she found was that patients who weren’t losing weight despite a strict diet had started with a “different” metabolism. “I knew then I was on to something,” she says. Traditional weight-loss programs have been built on the assumption that everyone’s metabolism works the same. But Kress’ research suggests that people with Metabolism B (also known as insulin resistance) are overprocessing carbohydrate foods and turning them into excess fat despite diet and exercise. The Metabolism Miracle helps reprogram the body to handle carbohydrates. The first step does include eliminating most carbs, though they’re later reintroduced in a healthful way. In the book, Kress walks patients through the steps of the diet with a number of easy-to-follow rules, such as avoiding certain foods, drinking at least two liters of caffeine-free fluids per day, and avoiding gaps of more than five hours without a meal or snack. Still, Kress says it hasn’t always been an easy road. With her program deviating from the norm, she says she felt she had to go “up against the traditional associations.” And even today, she says the book remains controversial.